Pieces from the streets of Philadelphia, inspiration from art nouveau Parisian train stations and barn doors out of Amish country come together to connect this historical home to its landscape. Situated in Princeton, New Jersey, the property appears as though it had been buit and planted over several centuries, but the bulk of the job is fresh. Their aim was to produce a landscape that could connect the buildings, which they did by layering in style and history with salvaged pieces and inspiration from the past. Groundswell worked up an entire master plan of the property, such as hardscapes, structures, flow and a planting plan. 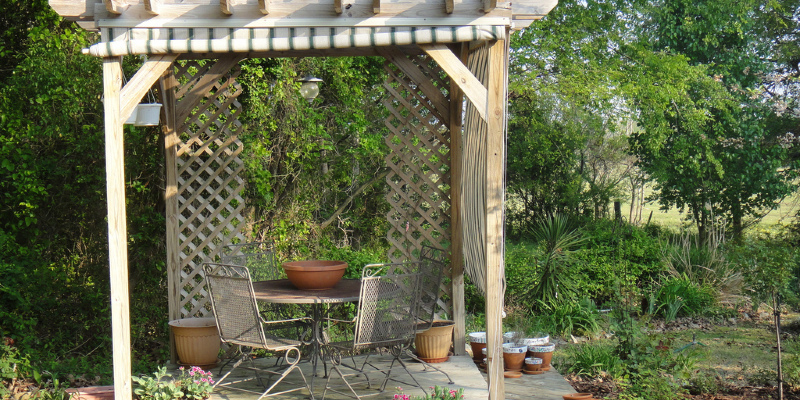 A new pergola structure is the main element that connects the shed to the home and the rest of the landscape. Fierabend dedicates a great deal of time to sourcing salvaged things for his projects. In cases like this the posts of the pergola frame are posts from decommissioned Philadelphia gaslamps, originally manufactured in the 1930s. “They have the first stamps on them from the steel mills they came from,” Fierabend states. The final bit is wisteria, which will be working its way up the posts and will gradually cover the arrangement with vines, hanging and leaves blossoms. The designers sourced closed doors for the shed from a deconstructed barn in Bucks County, which is roughly 20 kilometers from Princeton. They retrofitted them to fulfill the opening in the shed. One challenge was linking the job to the current adjoining brick driveway. Groundswell designed a new patio, made of argillite and bordered by a rock wall. “We wanted to tie into a rustic vibe together with all the pergola and potting shed, therefore we juxtaposed the tough edges of the brick with a more chunky and natural-colored rock,” Fierabend states. The rock picks up on different patinas on the pergola’s structure and the drop’s stones. The ensuing landscape looks as though it was developed over several years, befitting the historical property.